If you live in the DC area and haven’t heard about Crane & Turtle, the new restaurant in the Petworth neighborhood, I’m fairly certain it will be on your radar soon enough. It emerges amid a flood of new DC restaurants this past spring and summer, so it can be easy to get lost in the shuffle. But Crane & Turtle has noteworthy ingredients, and slow and steady wins the race. There’s Makoto Hamamura, a Japanese chef with French training. His resume includes seven years in the kitchen at the highly-rated CityZen. There’s the fact that the restaurant accommodates only 24 diners, which becomes a plus when you consider the cozy atmosphere and attentive service. There’s a chance to discover Petworth, which is not known for destination dining just yet. And finally, there’s the innovative mingling of Japanese and French cuisines, which results in dishes with clean and fresh components, punctuated with flair. White walls and ceilings, wood chairs, and blue fabric accents give Crane & Turtle a light and airy feel, despite its being pint-sized. The best seats in the house are at the sleek curved bar overlooking the kitchen. Here you get to observe and interact with the staff, and they can peer up and gauge reactions from diners. A member of the kitchen team tells us this is one of the pluses of the small space. He’s excited about the slow and steady growth of the restaurant, which is getting an increasing number of calls for reservations. (Thank you Crane & Turtle for taking reservations). The first section of the menu is “amuse de mer.” Designed to awaken the palate, the fresh and interesting small plate fish options are more generously portioned than I expect. 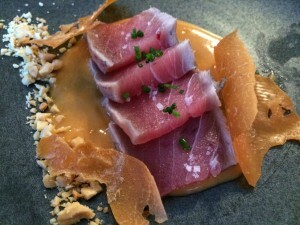 Big eye tuna tataki is a wonderful way to get started. Hay-smoked tuna rests atop satay sauce with a hint of heat. Texture comes from a thin chickpea crepe known as socca. 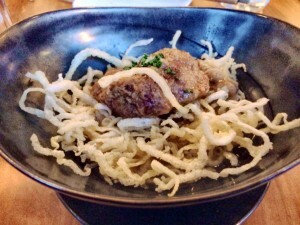 Our server recommends a special mackerel appetizer, but I can’t resist pork “ramen” with pork cheek and poached oyster. 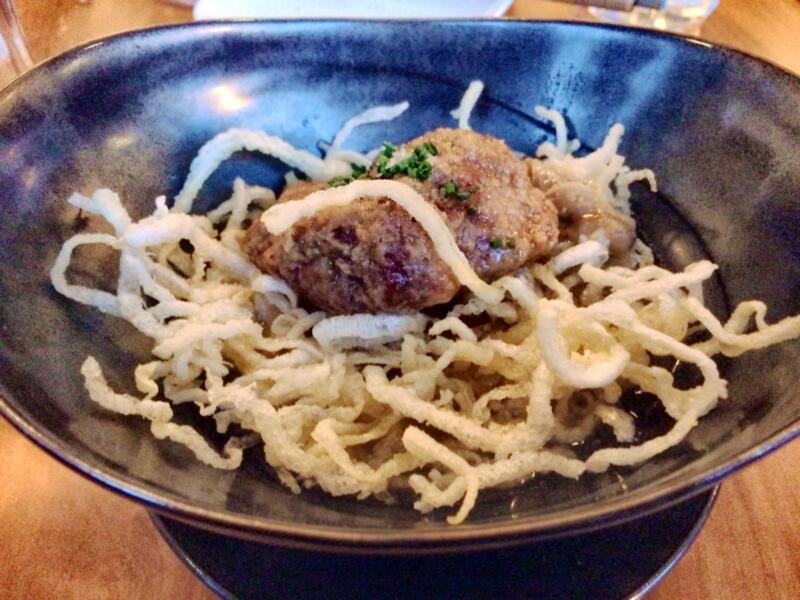 Ramen broth is poured table side over thinly sliced pork rinds (rather than noodles), causing an appealing crackle. I coax my husband to give me a few bites of the charred mackerel adorned with radishes and beans, which I end up preferring to the ramen. 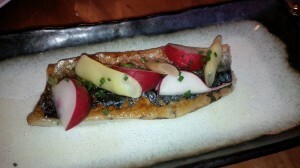 While mackerel is a fishy fish, the char mellows it just enough to elevate the flavor but not overwhelm it. If scallops are your thing- as they are mine- don’t miss the main course of sauteed Maine scallops with chorizo tapioca dumpling, arugula, and gingered coconut foam. 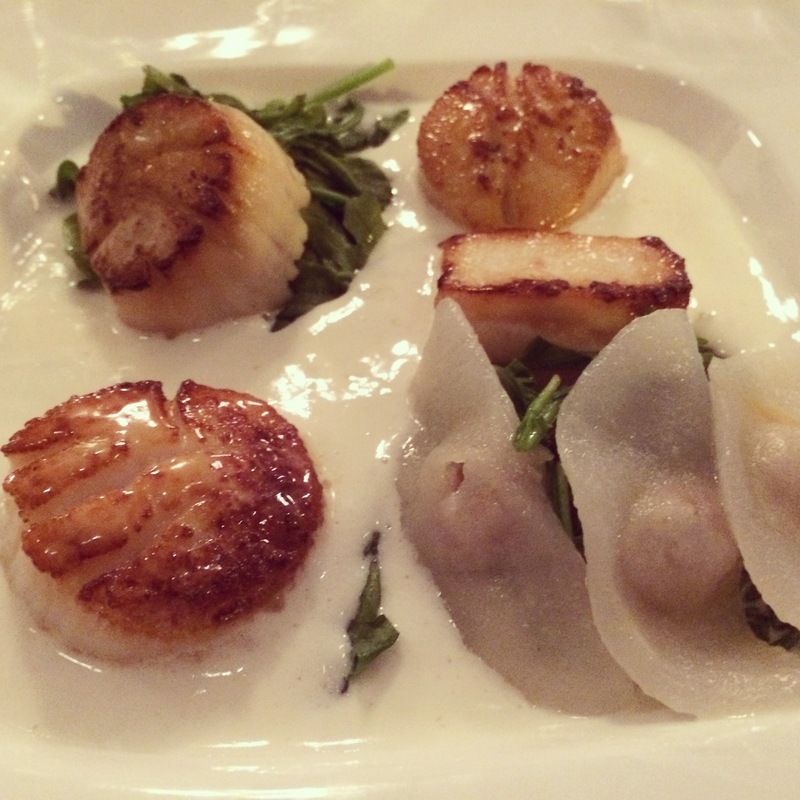 I love how the gingered coconut foam enhances the sweet scallops. I am completely enamored with the handmade chorizo dumplings. Is it too much to hope that this element on the plate will stick around, even if at some point the rest of the dish disappears from the menu? Luscious halibut meuniere and summer squash ribbon, new potato, and green tomato chutney further demonstrates the skillful fusion of Japanese and French technique and ingredients. 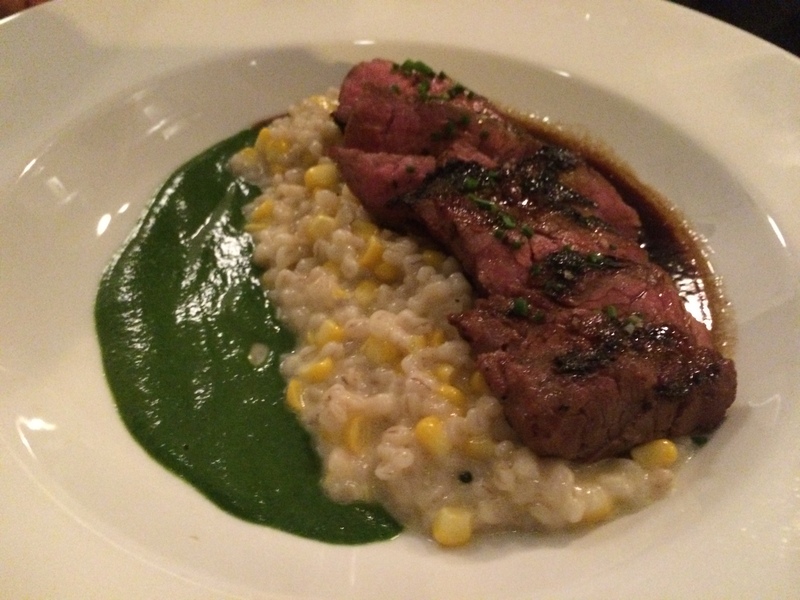 I take note of my friend’s dish of grilled meat called “Yakiniku.” The brimming-with-flavor dish is charcoal grilled short rib, barley corn risotto, and French-inspired bordelaise sauce. I intend to order this on an already-planned future visit, although I do reserve the right to change my mind. 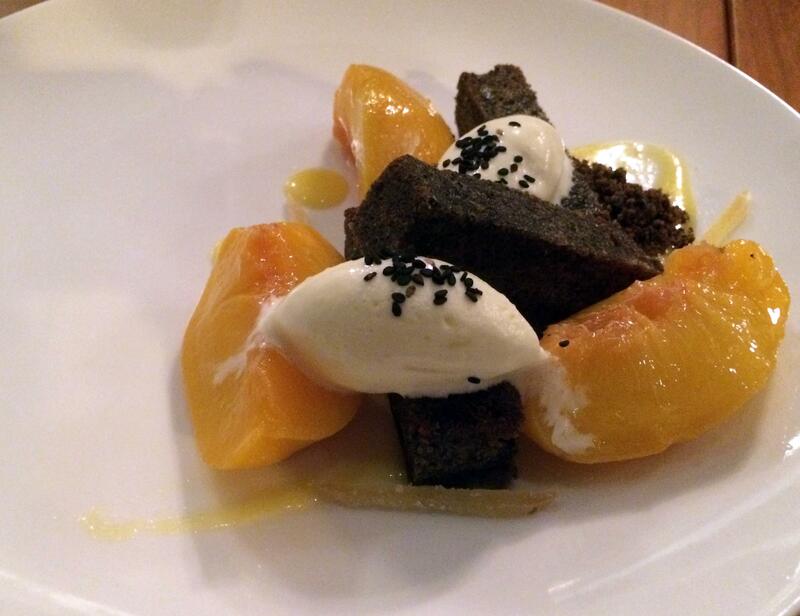 Peach compote with black sesame pound cake, peach curd, buttermilk ice cream, and candied ginger rounds out a meal that consistently delivers unique and compelling flavors. Many restaurants are paying increasing attention to coffee, as it contributes to diners leaving with a strong impression. My only quibble with the meal is that the French press decaf is visibly weak. This isn’t enough to dampen our enthusiasm, and it’s a simple fix. Crane & Turtle is named for a Japanese fable about mutual support and longevity. Based on early word of mouth, and our own first impressions, the name is fitting. Crane & Turtle has all the ingredients it needs to go the distance. So glad we went to Crane and Turtle for our anniversary. We never would have went if we didn’t read the reviews on your blog. We thoroughly enjoyed the food, the atmosphere — and the company (extra special that we ran into you there). The grilled quail, duck sczechuan and marinated salmon were stand-outs. Only dish that we thought was slightly disappointing was the firecracker squid, but overall the meal was terrific.Can’t wait to go back. great to run into you too Mim. thanks for sharing some bites of your food! I loved Crane & Turtle the first time I dined there, and after three subsequent visits, I love it even more.